Kematu is the Redguard leader of the Alik'r band that is sent from Hammerfell to capture Saadia, a fugitive who is hiding in Whiterun. He can be found in Swindler's Den. During the quest In My Time Of Need you will be faced with an important choice: whether or not to believe Saadia or Kematu. After Irileth informs the jarl about the dragon attacking the Western Watchtower during Dragon Rising, you may come across guards looking for a Redguard woman in the city. You may also observe an argument between Whiterun guards and Alik'r Warriors regarding their presence in the hold, or you may find Alik'r Warriors interrogating Redguard women in the Skyrim wilderness. At that point, Kematu will spawn inside Swindler's Den, doing absolutely nothing but wander around, waiting for you to arrive. He is clad in Hammerfell garb with a pair of Redguard shoes. He wields two scimitars and carries a boss-leveled amount of gold. 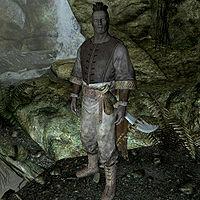 Once the Alik'r warriors show up in Skyrim and ask for a Redguard woman presumably living undercover in Whiterun, the related quest will initiate and you will have to ask around until you finally find Saadia at her workplace. When confronted, she will tell you her story, and will ask you to get rid of the Alik'r. She will then explain how it is done: "They're mercenaries, only in it for the money. They're led by a man named Kematu. Get rid of him, and the rest will scatter. I don't dare show my face, lest they recognize me, so you'll have to find out where they are." For the location of Kematu, you will have to visit the dungeon underneath Dragonsreach where an Alik'r prisoner has been put behind bars. When asked where Kematu is hiding, he will fearfully say: "You have a death wish, then? If you know that name, you must know to meet him would be to meet your end." He will also explain why he was abandoned by the Alik'r: "Because I was clumsy enough to be captured. Kematu always says we're supposed to be the best of the best. I wasn't." After you have paid his fine, he will tell you the location of his leader: "Very well. Kematu is west of Whiterun. It's an unassuming little cave called Swindler's Den. You realize if you set foot in there, you're never coming back out. They'll kill you. But that's your problem, not mine." When you have fought your way through Swindler's Den, you will find Kematu and several of his warriors hidden away in the final chamber. As you enter, the warriors will draw their weapons but Kematu will calm them down: "Alik'r, hold! You've proven your strength, warrior. Let's avoid any more bloodshed. I think you and I have some things to talk about." When you get closer to him, he will say: "Stay your hand, warrior! It's no secret why you're here and you have proven your skill in combat. Let us talk a moment, and no one else needs to die. I think we can all profit from the situation in which we find ourselves. My men will not attack you, if you will lower your weapons." When you talk to him, you can choose between two options. When asked why he is after Saadia, he will explain: "She sold the city out to the Aldmeri Dominion. Were it not for her betrayal, Taneth could have held its ground in the war. The other noble houses discovered her betrayal and she fled. They want her brought back alive. The resistance against the Dominion is alive and well in Hammerfell, and they want justice." When you tell him you are here to kill him, he will respond: "Of course, sent by... what is it that she's calling herself these days? Shazra? Saadia? One of those, correct? Did she appeal to your sense of honor? Your greed? A more... base need, perhaps? It doesn't matter. No doubt she's convinced you that she's the victim. But, do you know why we pursue her?" If you tell him that you intend to kill him regardless, he will say: "I'd hoped we could work something out, that you would see reason. That we could avoid having to kill you. Very well, then. If that's the way you want to play it, we will." He will then draw his scimitars and attack. The more peaceful approach is to tell him what Saadia told you, that they are simple assassins: "Assassins? No, nothing so crass. "Saadia", as you know her, is wanted by the noble houses of Taneth for treason. We were hired to see her returned to Hammerfell for her crimes. You can help us with that, and make sure no one else gets hurt." While you can still choose the hostile solution, or choose to make him explain the story from Hammerfell once again, you can also ask what he wants you to do: "She trusts you, at least to some extent. She sent you after us, and has no reason to think that you'd do anything other than that. Convince her that we'll be coming for her, and she needs to leave. Lead her to the stables outside Whiterun. We'll be waiting to take her into custody. I'll gladly share a portion of the bounty in return for your efforts in seeing proper justice done." When you accept, he will send you away with: "Good. We'll be waiting for you at the stables. It will be good to finally be able to return home." Kematu: "We meet at last, my dear lady." Saadia: "What is this? What have you done?" Kematu: "Oh, come now. You didn't really expect to manipulate people forever, did you? Your luck had to run out sometime." After the quick conversation, Kematu will cast a Paralyze spell on Saadia. When you approach Kematu after this, he will say: "Now, we'll take our friend here back to Hammerfell, where she will pay the price for her treason." You can then ask if she will be harmed, and he will respond: "Not on the way back. Once she gets there, it's not up to me to decide what's done with her. And as for you, I owe you a portion of the reward, don't I? Well, here you go. Spend it wisely, and if I may... Don't allow yourself to be fooled by a pretty face. You're better than that." He will stay at Whiterun stables and if you greet him, he will thank you: "Thank you for your trust. I am eager to return to my homeland." Kematu can be found in Swindler's Den even after Saadia is betrayed and the quest finished. This page was last modified on 24 May 2016, at 03:17.